Today was a huge day that will be the most memorable of the CDT for me. It was a 16 hour epic 30 mile dry stretch, where I summited 16 peaks (including two over 14,000ft), had plenty of steep off trail climbing and knife edge scrambles, and a light snow storm. To top it off I literally fainted and fell into a creek well after dark as I was looking for a campsite, but I will get to this at the end. Warning: This is the longest journal I have ever written. The day started off normal as I woke up around dawn and set off down the trail. I picked up my last water for the day, before beginning a 2,000ft (600m) climb up to the divide that I would be spending the day traversing the endless ridge. 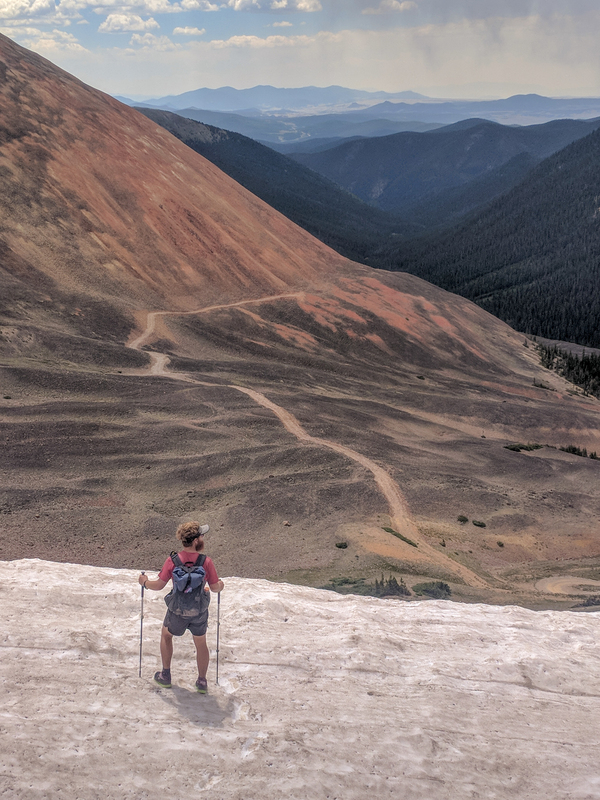 When I reached the top, I turned off from the Colorado Trail and said goodbye to the lovely marked trail and said hello to dirt roads and grassy ridges. It was part jeep road and part trailless until Red Cone. This is the most interesting mountain to date. The normal geology radically changed to this vivid red volcanic scree just on this one mountain. I only took a liter of water for this long stretch. My plan was to collect water from snowmelt on the way through. Unfortunately all but one of the snow banks were on rock, and I could not get to the water. I switched solutions and everytime I drunk 250ml I would pack the bottle with snow and let it melt in the hot alpine sun. This worked exceedingly well until the afternoon storms rolled in and the temperature dropped off to the point that snow started to flurry down. From that point around mid afternoon I did not have access to water and started to slowly get dehydrated. As the day progressed each climb seemed to get steeper and steeper. Or it could be that I got progressively more fatigued…. Either way, the day got harder and harder. I really started to notice it when I took the Argentine Spine Alternative in order to stay up on the divide and not drop down into the valley. It was totally off trail and therefore it involved climbing straight up and over the peaks. I eventually got back on trail around dinner time and thought that things would become easier. I was totally wrong. The ‘trail’ was cairns or the ridge was a knife edge and there was only one option to progress. made my way over the light scrambling required, with huge drop off to the valley below. It was so much fun and took my mind off how tired I was. Once through the knife edge I looked up at my last challenge of Grey’s Peak at 14,300ft (4,350m). Between the beautiful ridge that I just completed and the summit awaiting for me to conquer, I seemed to get my second wind and the climb became both easy and magnificent as I watched the golden rays of the setting sun beginning to light up the sky. I reached the top and took a few minutes alone to enjoy the absolute silence as I looked down on all the mountains around. Well all but one, Torrey, that is only a few feet lower and only half a mile away. I left the peak and when I was down a the saddle of the two peaks I decided to drop my pack and run up the other peak. I arrived right at nightfall to a red explosion of the fading sun. Simply beautiful. On the way down I thought it was a perfect day, and the only improvement would be if I had my actual camera rather than just my phone. I had taken so many photos that my phone was almost flat, so I put it on charge. I continued to head down and reached a creek for my first water in such a long time. I was rather dehydrated by this stage and was standing on a rock in the middle of the creek and downed almost the whole litre. Halfway through drinking I started to get lightheaded and the next thing I know is that I am lying in the creek. I was a bit confused… had I just fainted? This had never happened before but it only took a few seconds to regain my witts and I looked around and noticed that my phone and battery pack were underwater. I quickly scooped them out and turned off my phone. The battery pack was dead, but I had hope for the phone inside a waterproof case with only the usb port open. I only had a couple of cuts on my legs, but other then my ego was unscathed. It was reasonably obvious the reason as I could tick off multiple possible reasons at once: Dehydrated ✓, Elevation ✓, Low blood sugar (I had not eaten dinner) ✓, Standing up quickly and loosing blood pressure ✓. I walked another half an hour to the carpark and found a nice spot in the woods to camp. I felt perfectly fine, but asked the person in the next camp to check up on me before he left the next morning to summit the mountain.